After many range bound oscillations in the previous week, the benchmark NIFTY50 ended the week with a small up-tick as it ended with net gains of 122.40 points or 1.16%. Most of the entire previous week was spent by the Markets consolidating in a defined range after it achieved its breakout from the 10490 zones. In the coming week, we might see the Markets continuing to trade in a defined range with a upward bias. 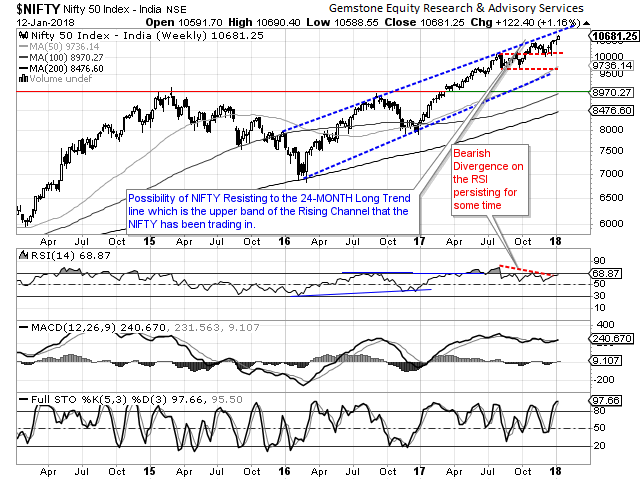 As indicated by F&O data, the NIFTY is likely to advance to test its 24-month rising trend line and following that, might see some corrective moves. The possibility of the NIFTY testing levels of 10750-10800 zones cannot be ruled out, though it may do so amid intermittent minor corrective moves. The coming week will see the levels of 10750 and 10835 levels acting as possible resistance on the upside. Supports are likely to come in at 10600 and 10535 levels. The Relative Strength Index – RSI on the Weekly Chart is 68.8730. A Bearish Divergence is observed as the NIFTY formed a fresh 14-period high while the RSI did not. Weekly MACD is bullish as it trades above its signal line. A Rising Window occurred on Candles. This is essentially gap and often results into continuation of up move. The pattern analysis shows that the up move in NIFTY remains secularly in place. It is continuing to post higher highs amid intermittent consolidations and it may continue to doing so. However, around 10800-mark, it may face very stiff resistance to its 24-month long upward rising trend line. Overall, if we take a immediate short term week for next 2-3 weeks while we approach the Union Budget by that time, we may see some run-up continuing. However, in great likelihood, the Markets will not disregard the serious resistance of 24-month long trend line that it will approach in the process. We recommend that while making select purchases with each consolidation or minor corrective move that we witness, the up moves should also be utilized in realizing profits at higher levels and lighten the portfolios as we approach the 10800-mark. Any moves following that should be made to re-balance the portfolios or re-allocate the trading positions. A study of Relative Rotation Graphs – RRG that PSUBANKS are evidently slowing down on momentum on a weekly note. We will continue to see MEDIA, REALTY, AUTO along with NIFTY Next 50 attempting to relatively out-perform the Markets. Service Sector stocks along with FMCG are attempting to consolidate its performance and may continue to do so in coming week as well. 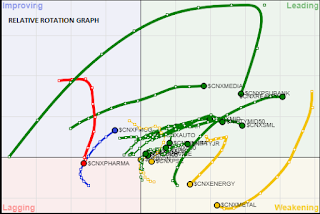 PHARMA has been underperforming over past several weeks and may remain an under performer on a Weekly basis. METALS and MID CAP Universe along with IT may see stock specific out-performances against the general Markets.